A key requirement for effective safety strategy is sustainability. Procedures and protocols have to be equally effective in 24 months time as they are tomorrow. A common method of sustaining safety processes over time is the checklist - a standardised list of the safety steps that need to be followed for specific field worker tasks. It’s a tried and tested method - something that’s used everywhere from the preflight routines of a pilot to the rigorous medical checks that are carried out before any surgery. 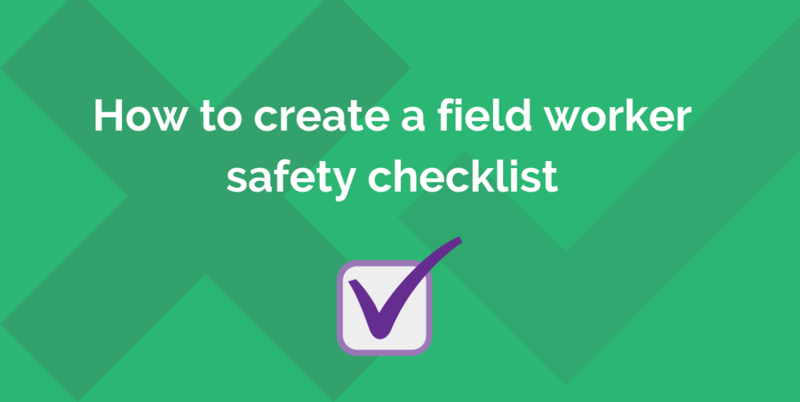 Safety checklists can be particularly useful for field services because of the nature of the work. Employees are often operating alone, with minimal direct supervision and in constantly changing locations. While it’s an employer’s duty to carry out adequate risk assessments, the shifting environments faced by fieldworkers means they also play an important role. Ideally, risks assessments are carried out with the supervision of a manager or safety supervisor but that’s often not possible. Fieldworkers need to constantly assess new locations and situations, highlights any risks or concerns. It’s a two-way process, with managers and field operatives having to work closely together, identifying issues and finding practical ways to minimise the risks. This kind of collaboration is made easier when information is handled digitally. When safety procedures are perceived as being imposed from above, there’s a danger of employees simply ‘following orders’ - following a prescribed checklist without actively engaging with the safety process. The most common problem with checklists is that they’re prone to being perceived as a needless ‘box ticking’ exercise; that they’re aimed at meeting regulatory requirements rather than genuinely protecting the health and wellbeing of employees. One practical way to minimise this is to ensure that safety information is specific to each task rather than relying on any kind of ‘one size fits all’ paperwork. Managing this is made much easier with the use of digital management systems. Encouraging employees to make safety notes and following these up is another way to guard against complacency. Fieldworkers need to feel that the steps they’re taking are monitored and that they matter. Digital technology has opened up better ways to handle checklists than the traditional paperwork approach. A digital management system, such as MyMobileWorkers (MMW), enables safety notifications and checks to be integrated into workflow - delivered via a smartphone app. The use of cloud-based documentation and services such as Google Docs also allows a company to easily access and manage a wide range of safety forms, policies and guides from wherever they have an online connection. Images of workplace environments can also be uploaded, making them instantly accessible to line managers or safety supervisors. All safety procedures are tracked and stored - creating a digital record of compliance activities. The frequently of safety checks in field services means that checklists should be kept short and simple. While the temptation is to ‘cover all bases’, this has to be balanced against real-world practicalities. The HSE clearly states that risk assessments should cover only ‘what you could reasonably be expected to know’ and that businesses are not expected to anticipate unforeseeable risks. So checklists should focus only on specific risks related to a particular task or location. A streamlined process and a common sense approach will maximise the effectiveness of safety procedures.